7" Amber Handkerchief Vase - Hammered, Flemish? 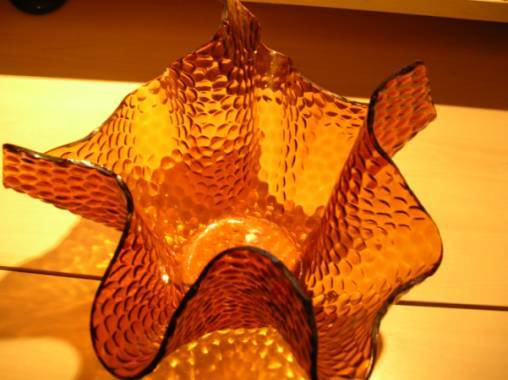 Topic: 7" Amber Handkerchief Vase - Hammered, Flemish? I'm so excited by this find that I've taken photographs before I've even washed it. Huge - 7" high. I've looked on the Chance site but could only find an example of Flemish and I'm not sure from the picture if the pattern is the same. I would have described it as hammered. David - if it is Chance and it's rare enough to be interesting, let me know and I'll send you some good pictures for your site. There was a fluted plate too, amber with a less detailed texture and a gold rim, but I was unsure about it..........should I rush back?? Re: 7" Amber Handkerchief Vase - Hammered, Flemish? I have noted this size, texture and colour. If you go to the cross-reference page and move right to the bottom, you'll see a little chart that shows all the ones I've identified. 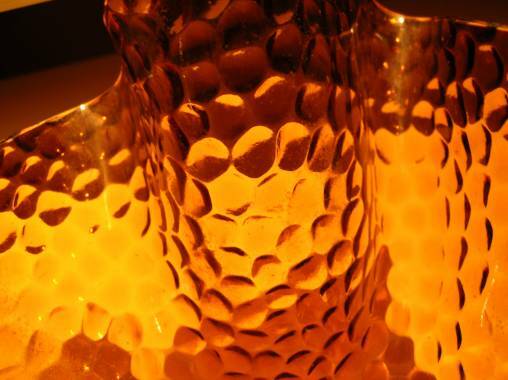 The hammered texture on a large vase is quite uncommon though, and one of the nicest, especially backlit. Yes, I've found the right place now and definitely hammered (the vase!). The plate would have been Flemish, I don't think large necessarily. It seemed a lot at Â£3.50, but if I'm not likely to see many of them at a lower price it might be worth picking up. I haven't forgotten I need to sign up for books - it's on my list. Glad I finally found something worth showing you!